Sometimes you just need a simple appetizer or snack food that you can make quickly and will go down easy with a glass of wine or some beers. This is that snack! It’s totally indulgent as is all game day food but this particular snack is loved by kids and adults alike. 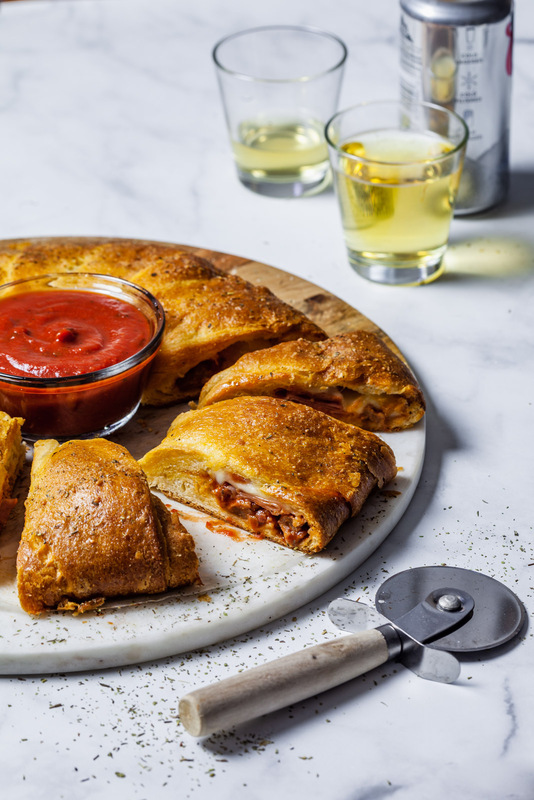 Who can resist pizza toppings stuffed into buttery dough baked to golden perfection? Maybe getting dough out of a can isn’t the ideal way to make all your baked goods, but just like store bought puff pastry, it sure does help when you need to make something in a pinch, and it’s so fun to pop open a can of it. 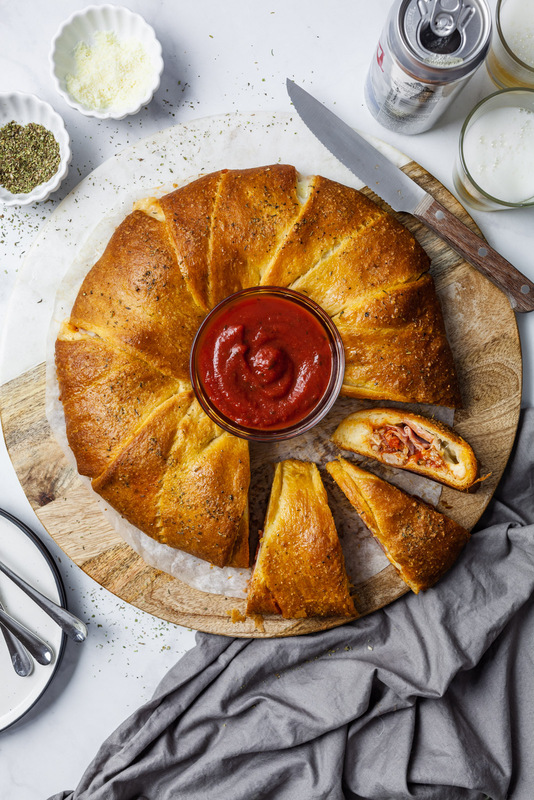 This pizza ring is like a Stromboli or an Italian style turnover except made using the ready made crescent roll dough. If you are strongly opposed to using crescent roll dough feel free to use puff pastry in its place. You will likely have to roll it out and cut it into pieces to use and the texture will be more crunchy/crispy than soft and doughy. Both are buttery and delicious though. 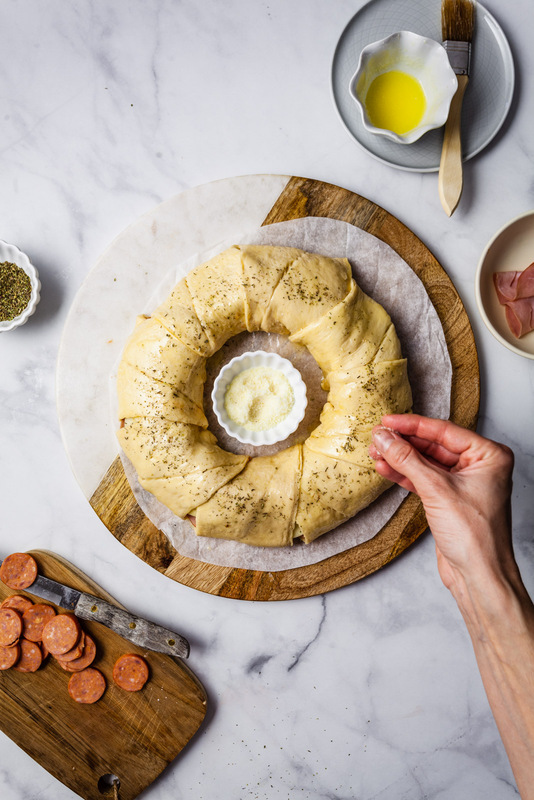 This particular pizza ring is a meat lovers version as it’s my hubby’s fav way to top his pizza and why I decided to fill it with all the different meats. The filing is so versatile though, and you can use whatever you would like in it. Whatever toppings you normally have on your pizza - just stuff the ring with. I would definitely be good having it with pepperoni and cheese alone or even a veggie version of it. Just a little heads up about the veggies if you prefer a veggie filled one. The ring bakes up quickly within 20-25 minutes, so if you choose to fill it with sweet peppers or onions or any veggie with a bite, you may choose to pan fry them in a bit of olive oil to soften them slightly before stuffing, otherwise they may still have some bite to them after they bake. 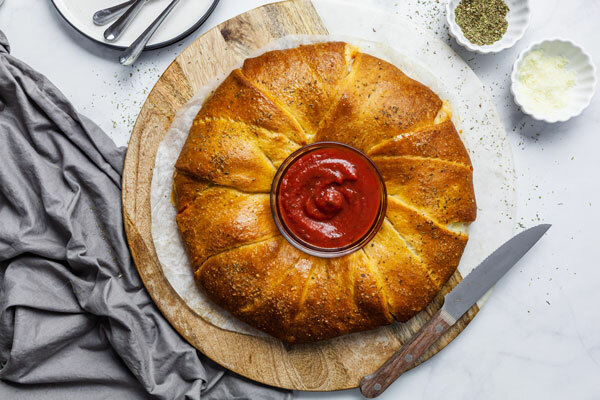 This is perfect for parties and always a hit. It also looks fabulous with the well- placed opening in the middle just big enough for a serving bowl to be nestled in. The perfect spot to put your dripping sauce in. 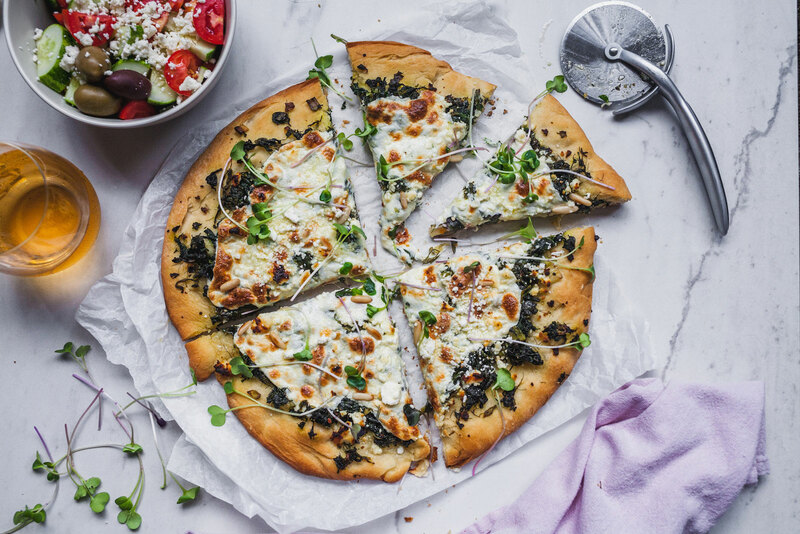 Can’t go wrong with a quick and easy snack like this! You will just have to take my word for it. In a small skillet over medium-high heat, cook the sausage, stirring and breaking it up into pieces, until browned and cooked through, 6 - 7 minutes. Transfer to a bowl and stir in the pizza sauce. Allow to cool a little, while prepping the other ingredients. Unroll both cans of dough; separate into 8 rectangles. On ungreased cookie sheet, arrange rectangles in ring so short sides of rectangle form a 5-inch circle in center. Dough will overlap. Put a 5-inch ramekin in the center of the circle. Spoon sausage mixture on the half of each rectangle closest to center of ring/bowl. Cover the sausage with the ham slices. 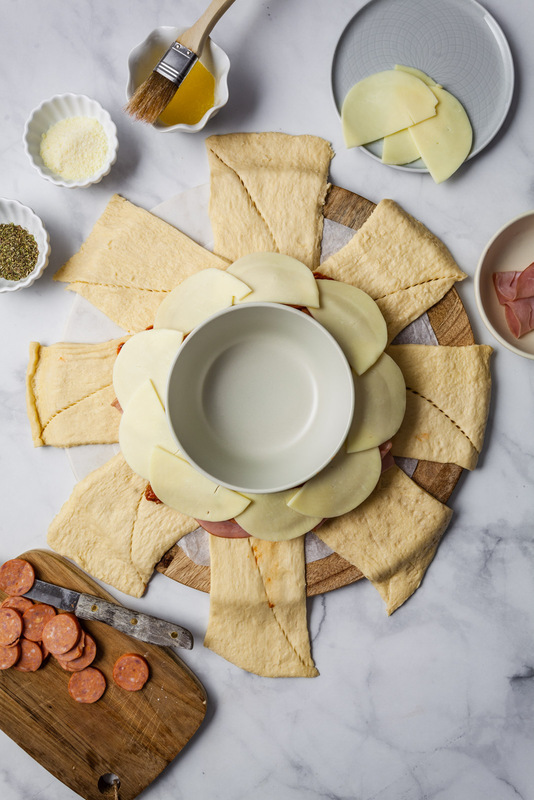 Top the ham with the pepperoni and then cover pepperoni with cheese slices. 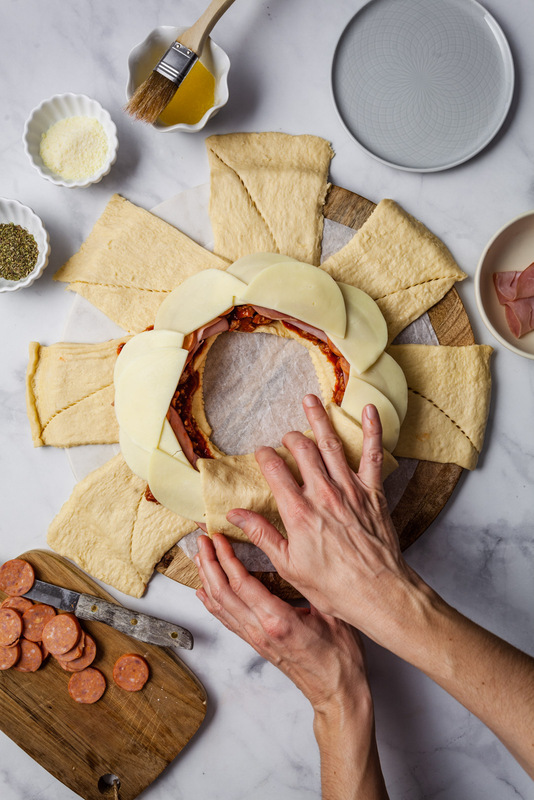 Bring each dough rectangle up over filling, tucking dough under bottom layer of dough to secure it. Repeat around ring until entire filling is enclosed (some filling might show a little). Gently separate dough perforations on top until filling peeks through (optional step if you want a bit of the filling to ooze out - if not just leave as is). Brush top of dough with melted butter, and sprinkle with Parmesan cheese and seasoning. Bake 20 to 25 minutes or until dough is golden brown and thoroughly baked. Cool 5 to 10 minutes. 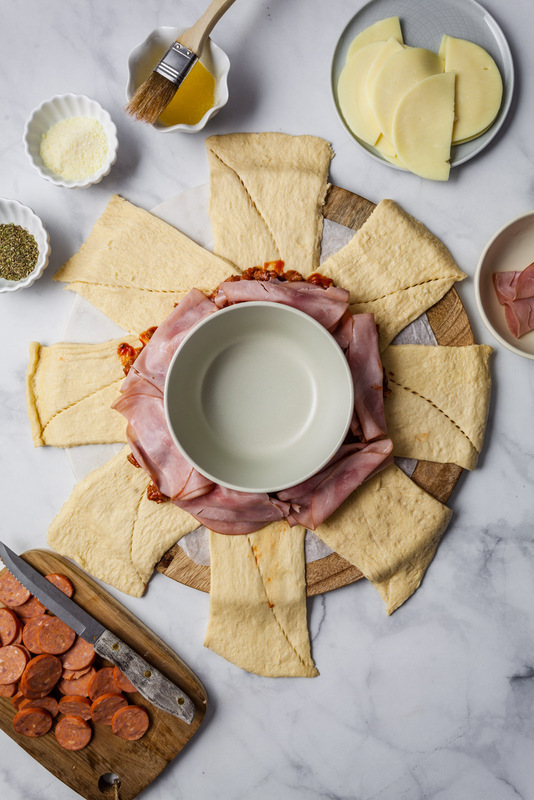 Use a spatula to slide the ring off the baking sheet onto a platter. 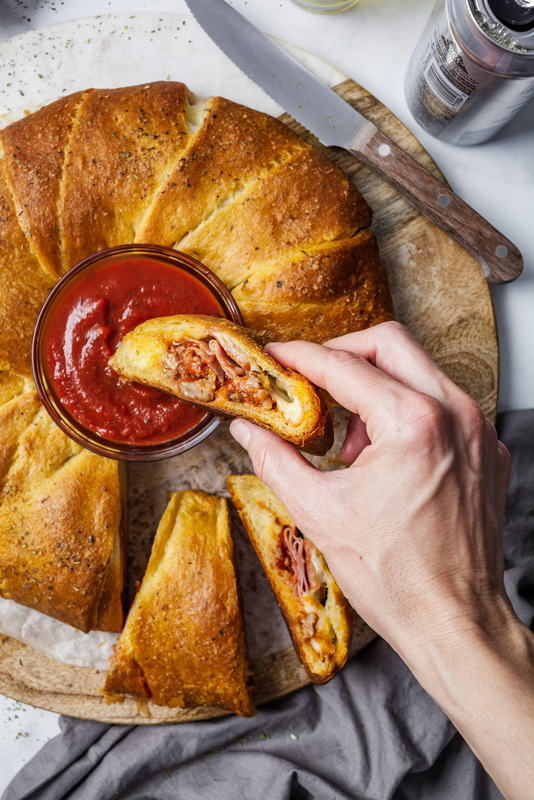 Slice and serve with more pizza sauce. Pulse the garlic 2 to 3 times in a food processor until coarsely chopped. Add the rest of the ingredients and process until they’re completely puréed, stopping the motor and scraping down the sides of the bowl as needed. This sauce is ready to be used as is — no cooking required. Just spoon it onto a round of pizza dough and use the back of the spoon to smooth it out. This amount of sauce makes enough for 8 medium pizzas, depending on how much sauce you like on your pizza. Refrigerate unused sauce for up to 1 week in a sealed jar or container. To freeze the sauce, spoon any unused sauce into muffin tins or ice cube trays. Freeze until solid, then pop the frozen cubes out of the mold and transfer to a freezer bag/container. Thaw overnight before using on pizza, or microwave the cubes in 30-second bursts until they melt into a sauce.